A Price Distribution chart contains data which looks entirely different than the other chart types available in X_STUDY. As such, the chart has a unique context menu. 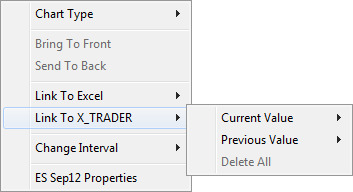 For X_STUDY 7.8.1 and higher, Price Distribution charts in X_STUDY 7.8.1 and higher now allow you to directly link out specific values to Excel and X_TRADER from the context menu. 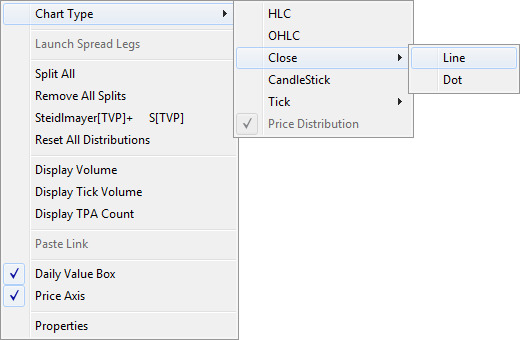 Right-click a Price Distribution chart to access the primary Price Distribution context menu. 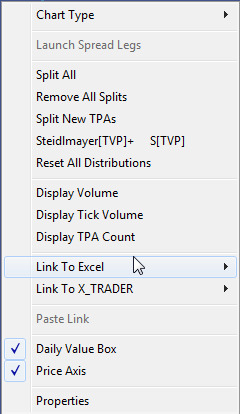 Note: The Split New TPAs, Link to Excel, and, the Link to X_TRADER options are only available in X_STUDY 7.8.1 and higher. Price Distribution: Displays the distribution of price over time. Split All: Separates each TPA into one column so you can better view the distributions and breaks. Note: Rather than split all, you can manually click a TPA to split it into its own column away from the cluster. This cannot be done if Auto Split is checked. Refer to Examples of Splits. 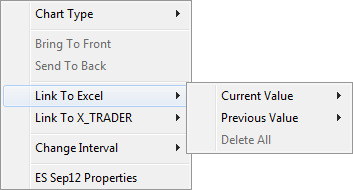 Remove All Splits: Returns all TPA letters in a session back to their original position. Split New TPAs: X_STUDY 7.8.1 and higher allow you to automatically split all new TPA bars. This option is not available when Steidlmayer split mode is active. Steidlmayer [TVP] Auto Split: Creates splits based on the Initial and Breakout Lookback properties in the Properties menu. Reset All Distributions: Unmerges merged distributions, removes Steidlemayer [TVP] and all splits. Display Volume: Adds a horizontal bar chart next to the data to represent the quantity of the transactions at each price. Display Tick Volume: Adds a horizontal bar chart next to the data to represent the number of transactions at each price. Note: Either or both bar charts can be displayed. If both are displayed, the Tick Volume chart is displayed second. Display TPA Count: Adds the TPA Count window to the bottom of the chart. When enabled, the TPA Count follows your cursor and shows the Time Price High (TPH), Time Price Low (TPL), and counts above and below the cursor (TPA). Refer to TPA Data Window section in . Link To Excel: X_STUDY 7.8.1 and higher allow you to copy and paste data into Excel directly from a Price Distribution chart. 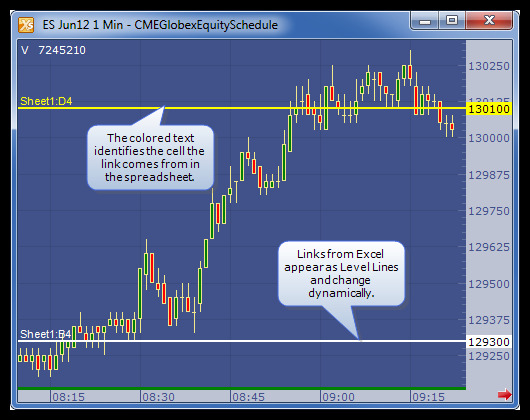 Link To X_TRADER: X_STUDY 7.8.1 and higher allow you to copy and paste data into X_TRADER directly from a Price Distribution chart. Current Value: Current Open, High, Low, or Close. 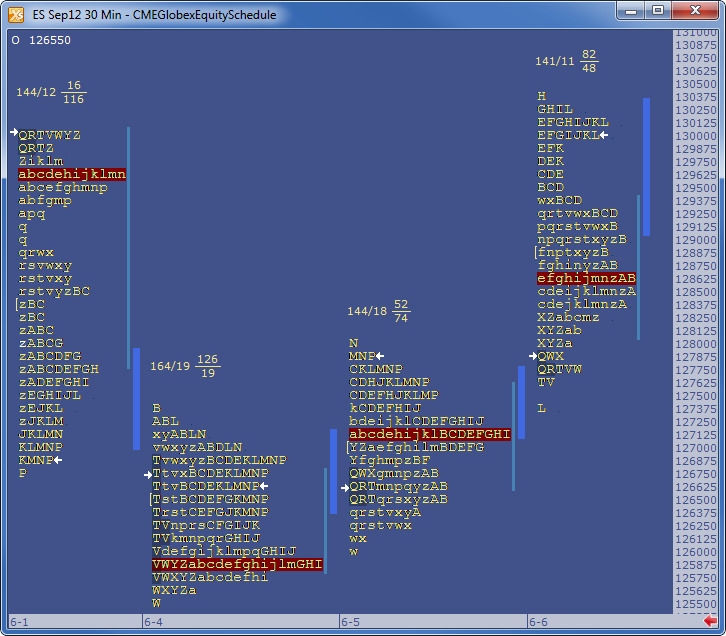 Previous Value: Previous Open, High, Low, Close. You specify how many bars to copy.